Do you know how to use your Resources to maximize Return on Investments? Where are the true open-the-door infrastructure costs in the picture? Can you identify the Revenue and Fixed and Variable Cost Functions in the picture? If you can identify the Revenue and Fixed and Variable Cost Functions in the picture, can you explain why they are designated as such? Why is the line for infrastructure flat? Can you explain the line for the Return on Investment? Finally, can you create a model of this picture for your business? 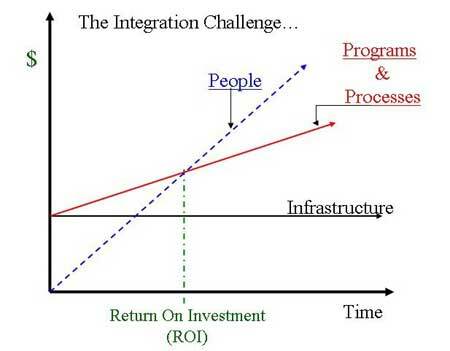 Noble Solutions understands and can help you create solutions for the Integration Challenges in your business. To learn more about Noble Solutions, click here.